Well it's hit a whooping 28 degrees here already this morning so the warming trend is arriving. Yea!!!! My blood has thinned considerably since we lived up north so this below freezing stuff was killing me. I let Mark take the car everyday just so I didn't have to leave the warm bed and brave the cold. I just wish I could make the hot flashes happen on demand instead of willy-nilly then I could handle the cold better. LOL! We're still battling this croupy crud stuff but feeling better a little every day. Last night was a rough one with my cough returning with a vengeance so I had to break out the tough "cough drops" of jolly rogers hard candies. I hate cough drops taste so I always use hard candies instead and have Mark convinced that's best as well so we always have werthers or lemon drops around the house. But this time the old fashion taste of jolly rogers were needed. Do any of you remember going to the store to buy penny candy with your allowance? I remember taking my quarter or fifty cents, getting a paper bag and sitting on the floor choosing the exact perfect mix of chocolate, bubble gum and fruity flavors. I even remember when the store increased the cost to 2 whole cents per piece which was just mean!!!! What was your favorite? Was it sixlets, laffy taffy, double yum bubble gum, jolly ranchers, green apple gum or ????? 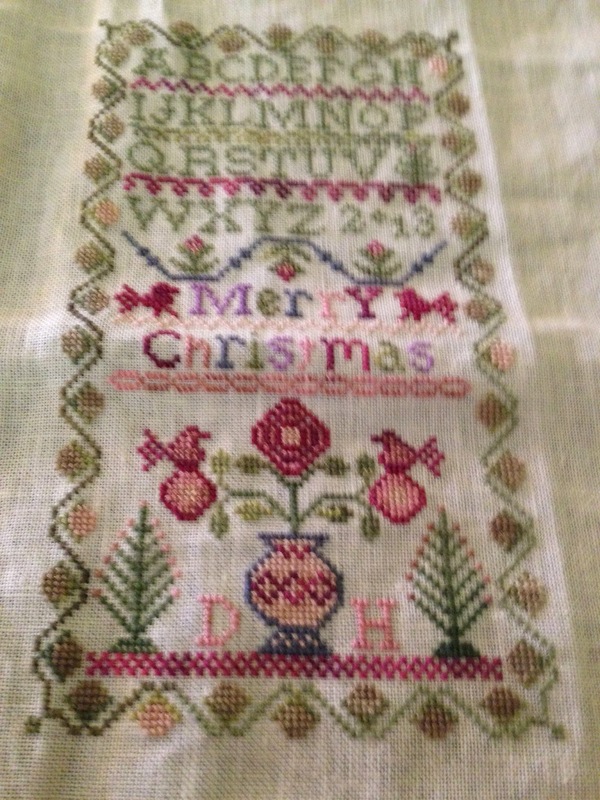 I finished my last stitch project for 2013 earlier this week so here's a quick snap. It's Merry Christmas by Blackbird Designs and the colors are just gorgeous in person. Who'd have thought of these colors for Christmas except the uber talented Alma and Barb? I can't wait to get it framed up and it'll give me a chance to try the framing shops here in TN. Sorry for the wrinkles but we don't have an iron here so it was just smoothed out by hand and not very well at that. Now the terrible news is that I finished my project but brought nothing with me to start next. Ugh!!!! I have some charts here that I enlarged on Mark's work copier a few weeks ago but no threads or linens and there isn't a LNS. What's a gal to do expect make a trip into Nashville to a LNS (man, I hope it's still there since I haven't been there in at least 9 years) or order online which we all know both of these options will cost me a small fortune! A stitcher can never, ever just purchase enough stuff to complete one project. LOL! Well Clarice is running like crazy thru the apartment trying to get my attention and play with her. She stands in a doorway and jumps/bounces on her back legs while standing straight up. We call it the kangaroo bop around her and it means she desperately wants some play time. My favorites were Jolly Ranchers. Still love them. Wish you could just get watermelon and cherry. My favorites were Jolly Ranchers. I still love the watermelon and cherry. Pretty finish - and I agree, the colors are unusual. Beautiful sunshine and warmer here - hope it is there, too. Good luck finding new framers!